I read a bunch last week discussing whether or not Groupon was worth it for small businesses. The article mentioned that while it does provide an excellent advertising opportunity (almost the perfect list rental situation), often the businesses do not wind up making money. 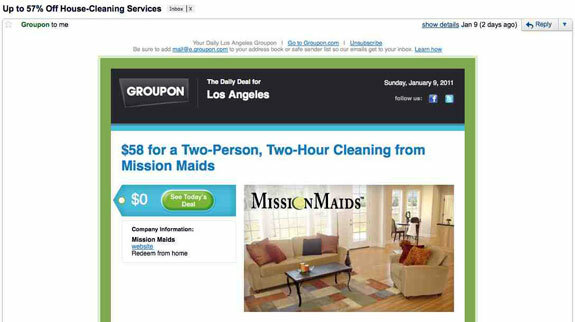 I believed that when I glanced at the Groupon email I received on Sunday that offered maid service for a whopping $0. In truth, the subject line read "Up to 57% Off House-Cleaning Services." Also, the headline on the email was "$58 for a Two-Person, Two-Hour Cleaning from Mission Maids." Not exactly the free maid service I mentioned above. I'll get to that now. Directly below the headline there was a button that read "See Today's Deal" with $0 listed next to it. I assumed this was a typo. I could see how someone might think there was another free deal, aside from the $58 deal listed in the headline. My apartment is generally pretty clean, so I didn't pay much attention. But I did think it a bit odd that there was a deal for $0. Sunday night, I received a second, correction email from Groupon. This second email explained the error in listing the price at $0. Groupon did several things right with this apology email and really only one thing wrong. We'll go through the good aspects first. The error was explained first. Second, they went with a lighthearted joke. They said, "Unfortunately, even we can't offer quite that good a deal!" Next they listed the correct price, which in fact matched the price in the headline of the original email. There was also detailed instructions how to cancel or change the order if customers were unsatisfied or confused with the deal. All good things. The list doesn't even end there. Along with their apology, Groupon accepted full responsibility for the error, absolving the maid service of any mistakes. Lastly, Groupon provided an email address if the recipient still had any questions or concerns. Bravo, Groupon. Excellent correction email. The one problem I did have with this situation was how long it took to actually send the correction email. I received the first email at 5:26 AM PST. I received the correction email from Groupon at 6:46 PM PST. More than 12 hours passed before the second email came. Granted it was Sunday, but there is no way it should have taken that long. Is there no quality control monitoring their emails? Groupon is a deal-a-day website. You only have the one day to decide whether or not to purchase. If there is an error, you should not have to wait more than 12 hours to get your solution. Time is of the essence here. There is a lot to learn from Groupon in this situation. Most of it good. Explain the mistake, apologize, accept responsibility, offer a solution and a place to ask any additional questions. A bit of humor never hurts either. You also need to consider your quality control procedures. Make sure any errors are corrected ASAP. How you deal with your email marketing mistakes can determine the future of your relationship with your subscribers. Take heed, because nobody is perfect.